Fermented / ripe Puer tea from Wuliang Mountain, Yunnan, China. 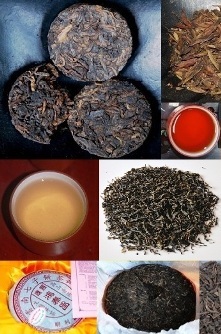 Winner of the Gold medal for the best ripened (‚shu‘) Puer tea on the Yunnan Government Puer Tea Competition 2011. Ancient Phoenix Competition Grade Ripe Puer Tea sticks out through an individual, full-bodied and soft velevety taste, dominated by coffee bean, chocolate and licorice notes, the biodiverse setting of the ancient tea trees of Yunnan’s Wuliang mountain and a centuries-old tradition of Pu Erh tea productin in the producer family. For more information and illustrations please see the detailed product description below. Ripe Pu Erh tea (fermented /cooked Pu Erh tea) from the Lincang area (north of Pu Erh prefecture) in Yunnan province, China. Ripened loose leaf “shu” Pu Erh tea; winner of our strictly taste-oriented initial in-house degustation of Yunnan Pu Erh teas. For more detailed information and illustrations please refer to the product description below.